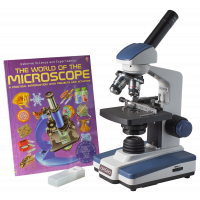 This year, treat the young scientist in your family to the Omano OM118-B4S microscope with a choice of 4 useful Accessory gift packs. 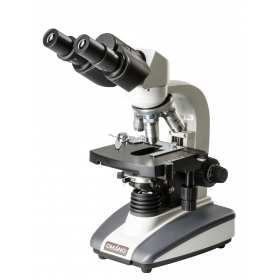 Part of the affordable OM118 series, the OM118-B4S is a binocular compound microscope that includes four objective lenses and a full floating stage for convenient slide handling on the microscope stage. Four levels of magnification, 40x, 100x, 400x and 1,000x are derived from two WF10x eyepieces and 4x, 10x, 40xS and 100xS oil immersion, objectives. Like the monocular sister microscopes (OM118-M3 and M4), this binocular version was introduced in 2010 as a more affordable alternative to our ever popular Omano OM36 series. 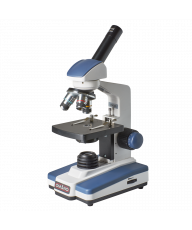 It has similar optics to the OM36C, and features a rugged, all-metal design and construction.The microscope includes a 5-year Omano limited warranty. 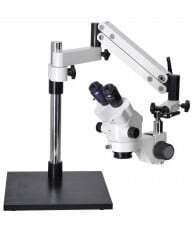 The Omano OM118-B4S includes a binocular microscope head that is inclined at an ergonomic 45 degrees. The head rotates through 360 degrees for flexible viewing positions. There are two Wide Field WF10x eyepieces that combine with four parcentered, parfocal achromatic objectives lenses, (4x, 40x spring, 100x spring oil immersion) for magnification levels of 40x, 100x, 400x and 1,000x. The objectives are set in a quadruple nosepiece. The oculars both have diopters that enable individual eye focusing while the head can be adjusted through 55-75mm to adapt for different interpupillary distances. The primary difference between this microscope and the Omano OM118-B4 is in the stage. 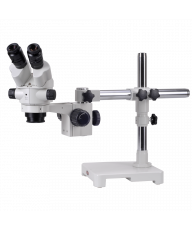 This microscope includes an integrated, double-layered mechanical stage as opposed to a detachable mechanical slide holder on the OM118-B4. In the final analysis, an integrated mechanical stage is the only answer for any serious student or professional microscopist. While a mechanical slide holder is an improvement on a plain stage, a mechanical stage includes full graduated X/Y movement (18mm x 70mm) with coaxial coarse/fine focus controls. 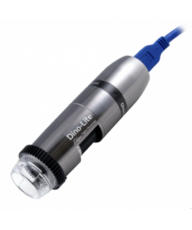 Such coaxial controls enable a student to move the slide without looking up from the eyepiece; for regular users this benefit is an indispensable convenience. Focusing includes high quality rack and pinion mechanics for longer life and coaxial focus controls for easier focusing. We recommend coaxial coarse/fine focus controls since they enable 'eyes down' focusing. In other words, the viewer does not constantly need to look up in order to find the other focus control. This benefit is important in enhancing a student's experience and therefore in encouraging a more sustained interest in the microscope. Safety features include a rack stop to ensure that the stage does not impact with the objectives and thereby break the slides and a slip clutch control to mitigate the risk of damaging the focus controls through over extension. The condenser is Abbe 1.25 N. A with iris diaphragm for optimal adjustments. 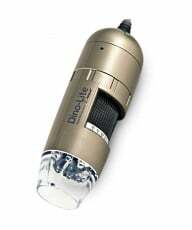 Transmitted illumination includes variable intensity and is rated for 110V/120V. Eyecups, Dust Cover, Manual, Spare Bulb, Spare Fuse, Immersion oil. Rocks, bugs, sea shells and antique coins are no longer safe, with this 20X Loupe in the hands of a young explorer. Also handy for hobby work and discovering the intricacy of a small flower or butterfly wing, picking out a sliver, admiring miniature art, viewing photography or helping Mom or Dad read the "fine print" of a document. This microscope slide kit contains a mix of 15 prepared slides in a durable plastic case. The selection of specimens are stained and carefully mounted on glass slides with cover slips. Each slide is labeled and conveniently arranged in the plastic case.